the Oberpfalz, Free State of Bavaria, present a Bugatti 16.4 Veyron conversion. Besides a set of wheels, specially designed for the super car, many body panels have been replaced by ones made from carbon. On this occasion, the tuners enlarged the inlets to enable the 16-cylinder motor breathing more cooling air. The engine has got a new exhaust system too. 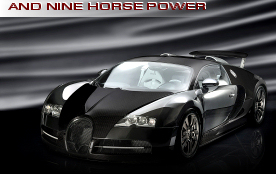 Thanks to these changes the Mansory Veyron generates round 10% more power: 1,109hp, as the house claims. So the car doesn't crank out the 1,001 standard horses anymore, however, Mansory refers to this number by the name of their conversion: LINEA Vincero. The latter means: 'I will win', which is a citation from an opera by Puccini: Turandot. The plot stems from a Persian tale of 1001 days! Maybe the context would be more obvious if they would have used 1001 LEDs for the Ambient Illuminations System! We don't know the exact number of them, but know it to exist. Further refinements of the cabin cover the interior parts. Of course, only the finest materials are used for that. Mansory says that the series is strictly limited, but don't give away any number. On the other hand, the amount of those who are keen on pimping out their Veyron is limited enough - after all many invested on the one-million-euros-thing as a collectible, rather than as a sports car!